It was just two years ago that Microsoft’s Internet Explorer web browser controlled 67 percent of the worldwide market, according to data from web analytics company StatCounter. It has been all downhill from there. According to the the latest data from the company, last month, September 2010, marked the first time IE fell below the 50 percent share mark in the past decade. Of course, this data only counts what StatCounter collects, but they claim that it’s a huge dataset worldwide — billions of visits from millions of sites. And the trend is clear: two years ago, two-thirds of those people were browsing the web with IE, now less than half of them are. So why does IE keep falling? Well, for one, for the past five years or so it simply hasn’t been a good browser. Microsoft appears to finally be attempting to change that with IE9 — but that’s not officially out yet (it just went beta). It’s notable that in StatCounter’s breakdown stats, IE8 lost market share for the first time ever, which led to the overall number going below 50 percent for IE. 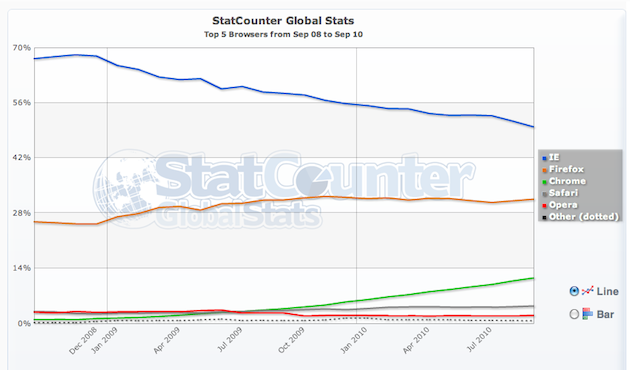 As IE has been falling, rivals Firefox, Chrome, and Safari have been rising. But while both Firefox and Safari have had various growth spurts throughout the past two years, Chrome is the clear winner. The browser has gone from 1 percent of the market two years ago, to 11.5 percent last month. That places it well ahead of the older Safari (at 4.4 percent) and only behind Firefox (at 31.5 percent) and IE. The hated IE6, meanwhile, continues to fall. It’s down to 7.4 percent now, according to the data. Two years ago, it made up nearly 30 percent of the market by itself. The last time IE was below 50 percent market share appears to be the late 1990s. Back then, of course, Microsoft was up to some sketchy (and in some cases maybe even illegal) tricks in order to drive then-leader Netscape out of the market. It worked. By the mid-2000s, Microsoft had well over 90 percent of the market. If the more tech-savvy audience of TechCrunch is any indication of future trends, Microsoft is going to need IE9 to be awesome out of the box, otherwise they’re in trouble. IE is currently the number four browser in terms of traffic visiting TechCrunch. Firefox, Chrome, and Safari all destroy it. And yes, remarkably, Chrome will soon be king.